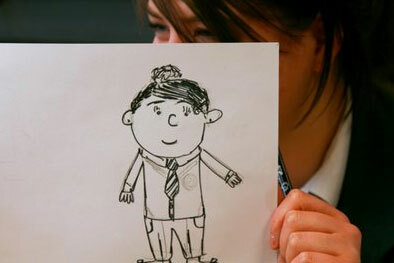 CHARLIE BROWN YOURSELF - leading straight on into simple but distinctive characters, the group is introduced to Peanuts and Charlie Brown, then shown how to construct an easy self-portrait using the same basic big round head, small boxy body template. We use thick black felts to prevent us adding too much detail or fancy shading, and I restrict the time allowed too. I'll then collect them all in, and we'll guess who is who. Successful ones are usually the simplest, and have taken on board the idea of including distinctive features (freckles, hair, props...) from the first game. Time allowing, we might have a go at this pose sheet, which helps us draw the same cartoon-self in a variety of poses and positions. This sheet is great for building confidence, and the figure skills are transferable to all sorts of other human and animal forms. SPEECH & THOUGHT - I describe this as another way of bring these characters to life on the page. I'll demonstrate the wrong way to create speech ( drawing the bubble first then cramming the words in), then have them make one by writing the words first, before drawing the shape around it. We'll have a go at shouting, whispering, and importantly conversations - letting the group discover that because we read from left to right (and top to bottom), our bubbles need to be carefully placed. With thought bubbles, we can see what people are really thinking, and sometimes it can contradict what is being said out loud (see image). We'll also have a look at real examples of how comic artists have used different techniques and treatments to achieve a range of results (including the all-important silence). JAM COMICS - Some participants are initially disappointed that I'm not going to teach them to draw the 'Marvel way', or Batman's muscle structure. I explain how that style of comic involves a large team working together, writing, scripting, pencilling, inking, colouring etc. As a fun way of generating some unpredictable stories but also to encourage them in responding to each others ideas, we 'jam', as musicians might do. One artist draws the first panel. After 5 minutes everyone passes, and receives someone else's work. Everyone then draws what they feel the next panel should be, and after 5 minutes we pass again a third and final time. This game can be reversed, by drawing the final panel first then working backwards, or expanded on by drawing 2 panels or a full page each, or by continuing to pass the stories around. I also like how this is a good 'test' of our character designs, as we all have to draw each others, and its interesting to see what features others pick up on. 2 (or 3) CARD CHARACTERS - I need a better name for this; sometimes it's 'the animal job game'. It's the most popular drawing game I do by FAR. I had a group of 16 year olds in Carlisle delighted to repeat it 4 times, and we could have gone on. This exercise works just a well with kids and adults, despite actually being quite a challenge and not a doddle. I must thank Steve Bissette, Earth's best comics teacher, for introducing me to this (and much of what I teach). For younger groups or first attempts at this game I'll use just the first two sets of cards - animals, and jobs. The third set, emotions, I keep back for advance groups and masterclasses (I even have a set of 'randoms' I occasionally use too). OK, everyone receives one of each card, and then has to create a drawing of that animal doing that job, hobby or activity. I'll give them between five and ten minutes to do this, then I'll collect them in to show and for all to guess the words. This game, it soon becomes clear, is not about drawing animals at all, but visual communication and clarity. I'll always try to play this game again later in the session if time allows, as then everyone is much more focused on what they need to emphasise, include, and importantly leave out of their drawings. We might even try it with 3 cards. This game also creates some fun characters with potential to be included in further games or strips. More on this game here. We then discuss how varied our treatments are (what does that situation depicted feel like now it's night-time outside? ), and how all have strengthened and enhanced the initial image. I'll encourage them to utilise their black pens as much as possible with all work done from this point. Back in 2006 I was lucky enough to attend a two-day Grassroots Comics Trainers workshop. As director of World Comics India, Sharad Sharma has led hundreds of similar sessions across Asia, Africa and beyond. WCI advocates comics as a developmental tool, empowering small, rural or impoverished communities to take control of their communications. Whole villages take part in learning the basics of comics, and then share their comic poster and campaigns addressing social, political, cultural and environmental issues. These grassroots strips can use local dialects and references, and speak with a straightforward immediacy and humanity not found in other media 'from above'. 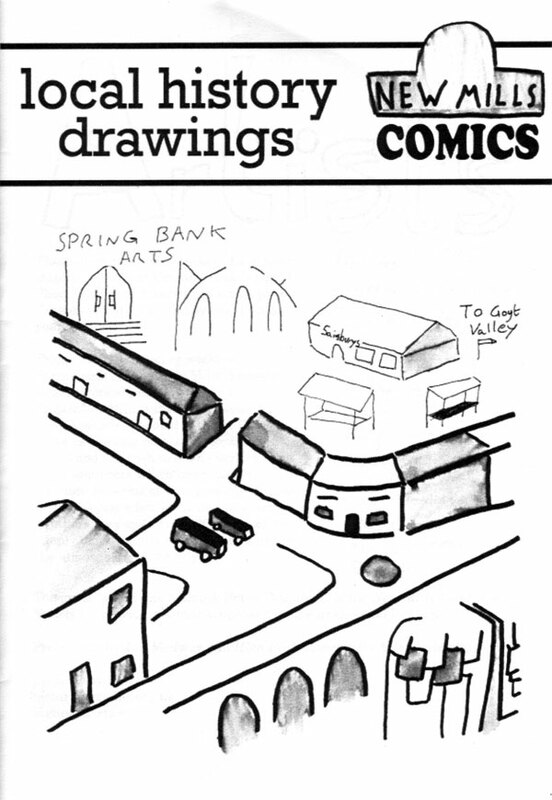 In 2007 I ran my first community comics programme for Community Pride Initiative in Manchester, who were commissioned by the Policy Studies Institute to gather local responses to the findings of a new report into social cohesion in Moss Side by the Joseph Rowntree Foundation. Working with a number of youth clubs, plus an elderly Afro-Carribean Diabetics support group The Sugar Group, I engaged participants in the report findings through drawn interviews, comics role-playing, and simple collaborative strips which put the participants centre-stage as protagonists and commentators. Comics are also an ideal way of beginning a debate about your community or surroundings, or investigating local history. The results can be cheaply and easily shared in a simple photocopied and stapled format. This excerpt from a 2013 New Mills Local History project with an adult mental health group used old photographs of the town as a starting point, creating poetic time sequences inspired by Robert Crumb's Short History of America. In partnership with the Lakes International Comic Art Festival and a cluster of small Lake District museums, Jim spent two days with children from Langdale Primary School to create this comic. The school borrowed artefacts of local interest from the museums, prompting the children to investigate their uses and histories. Their comic strips each bring to life an aspect of the item's story, and were compiled together into a published collection which the children enjoyed selling alongside other professional comic artists at the festival event in Keswick. An accompanying window display formed part of a trail around the town. The children documented the whole process as part of their Arts Award. Produced to mark UK Disability History Month 2015, by the youth section of Greater Manchester Coalition of Disabled People. The comic stars 2 members of the group, who travel through time exploring Manchester's own disability history (campaigns and significant moments) and media portrayal of disabled people. Working with an adolescent mental health group to create personal responses to particular artworks, the young people used cartooning skills to depict themselves and others discussing and commenting on their chosen painting, Ophelia, by Arthur Hughes. The wider project has been acknowledged as providing a unique, creative and positive effect on the mental wellbeing of those involved. Forget about predictable and formulaic superheroes usually associated with comics; by depicting yourself in a strip, all of a sudden you are the protagonist, and your opinions, ideas and observations have an outlet not always available in the typical classroom setting. Some individuals are reluctant to express certain ideas out loud, but are able to draw themselves saying it. In this image, The young lad has been asked if he's sees much crime in his area. Verbally he denies it - "Neva seen", but then show what is really on his mind - "Apart from getting robbed every day. Scared to leave my house and looking at a scruff area". Even without speech, a simple drawing can communicate incredible humbling things, like in this image by a 13 year old ESOL student in Manchester. In summer 2017, I worked with three groups of young people to create a comic about Roman cavalry. Hadrian's Cavalry was a major exhibition distributed across 10 museums and heritage sites across the Hadrian's Wall World Heritage Site, which extends for over 150 miles across Tyneside, Northumberland and Cumbria. The exhibition featured a spectacular collection of artefacts including loans of Roman cavalry equipment from national and international museums and private collectors. The exhibition was supported by a programme of re-enactment events including Turma! when a full troop of 30 Roman cavalrymen came together for the first time in 2,000 years to perform exercises and manoeuvres described by Hadrian himself. Cavalry Comics was one of the Hadrian's Cavalry learning projects, inspired by facilitated visits to Hadrian's Wall, exhibition venues and taking inspiration from the objects on display. Milecastle Primary School (year 5), Allendale Cubs group and Tullie House Museum's Youth Panel each worked for 3 full day sessions, first learning basic comic skills, secondly visiting a venue to collect drawings and ideas, then a third session illustrating their visit. The resulting cartoons and drawings were then collated and sequenced into a loose narrative describing their experiences, discoveries and responses. The project was commissioned by Minerva Heritage and funded by the Arts Council. Whether children or adults who've produced the work, it's often nice to pull everything together and present what we've achieved. Groups are always impressed by the variety of format and subject matter amongst my collection of zines and mini-comics, which I'll share if we are thinking about publishing ourselves. By demystifying pagination, folding, binding, stapling and then distribution, participants are empowered with these skills, and able to go on to create their own publications in the future. Kids in particular are especially thrilled by 'product', seeing a whole stack of something they've been part of creating is a proud moment. A 2015 project took this self-publishing a step further. Working with schools and community groups in Limehurst, Oldham, 3 issues of the Friendly newspaper were printed and distributed around the area. All content was created by local residents, and covered local interest items such as Oldham Credit Union, the community garden, classes, clinics and celebration events like the Easter, Summer and Christmas fairs.